During winter, the whole family wants to hibernate – even energetic children who just love playing outdoors. However, once the frost has melted away and the sun is in the sky, your kids will be eager to take their activities outside. Not everyone has grass in their garden and those with concrete ground in their space knows the danger it can pose to clumsy little ones. To avoid any nasty bumps and scrapes, you should consider laying some child-friendly flooring in your outdoor space. 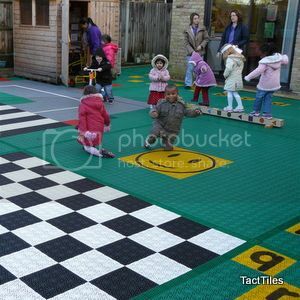 Retailers like TactTiles stock a fantastic range of play area flooring. This rubberised covering keeps playtime safe and is available in a range of different styles and colours. Not only is it practical, you will be able to allocate a section of the garden that your kids can call their own. Another safety hazard you need to contend with is plants. Thorny, prickly and stinging plants are a big no-no when it comes to inquisitive explorers. Remove all nettles from the garden and keep rose bushes and other thorny plants away from children. When it comes to using weed killer, select a brand that doesn’t use any harsh chemicals to ensure your little ones are safe. These can be hard to come by, so consider making your own. Thrifty Fun has some great recipes you could try. Outdoor toys are a great way of keeping kids entertained but to ensure their safety, you’ll need to make sure they are installed and assembled correctly. When building your child’s toys, always follow the manufacturer’s instructions fully. Guessing could result in the apparatus being put together wrongly, putting your little one’s safety at risk. As well as making sure they are suitably assembled, you should also ensure they are firmly fixed to the ground.